If you’re reading this and thinking is email marketing still relevant in a GDPR world, then the answer is yes! In fact, research from the DMA suggests that consumers still prefer email as a marketing channel above any other. In a survey of 2,016 consumers, 73% of respondents stated that email is their preferred marketing channel out of a total of eight. But all your efforts are worthless if no one’s reading the emails you send. What can you do? Read on to learn about 8 simple ways you can increase email open rates and really make an impact with your email marketing. Simple, right? When you’re not sure what someone wants (your husband, your children, your friends) what do you do? You ask them! Your email list is no different. You’re not a mind reader (and if you are, you need to change your business), so why do you think you know what your subscribers want to read? Asking your list is going to give you the answers. We all love being asked our opinions, and your email list is no different. So, start working on an online survey you can send to them. Open questions: What would you like to see more of in my newsletters? Then give people a space to fill in their answers. Multiple choice: What one thing would you like to see more in my newsletters? Then provide a choice from which they pick one thing. Multiple choice, rating choices: Rate the following from 1 to 5 (1 being the lowest and 5 being the highest) to tell me what you’d like to see more of in my newsletter. The survey doesn’t need to be too long. In fact, it can be just that one question. Use a tool like SurveyMonkey or Google Forms to help you collect the responses. Don’t forget to give people a deadline by which you’d like responses. Or, if you want an all-in-one small business marketing platform, give Constant Contact a whirl! You’re not a mind reader, so ask your email list what they want to read! Another resource for you to find out what interests your audience is your social networks. It’s likely that there will be people following you who don’t receive your emails. But, if they are your target audience, it’s worth asking them too. You can use the questions I suggested above, they are still relevant. Just remember to frame them in a way that makes sense, i.e. If you were on my email list, what would you like to read about? If you want to see whether there are any differences between your email list and social media followers, then set up a separate survey for both. That way, you can keep a track of where your responses are coming from. And while you’re there, include a link for people to join your email list. You may as well. As I like to say: If you don’t ask, you don’t get! 3. What’s your subject line saying? Your subject line needs to entice your readers to open your email. Long, woolly subject lines just don’t cut it. So, what can you do? Have you noticed emails that have your name in the subject line? I bet that caught your attention! It’s what’s known as personalisation. You’re adding a person’s first name to the subject line and that makes the email feel like it’s written just for them. In addition to action words, things like exclusivity and limited availability will help to improve your open rates. For example, exclusive offer for you or time’s running out. Think of ways you can use your subject line more creatively to pique people’s interest to increase email open rates. Make sure it’s snappy and viewable in the inbox by sending yourself a test email and looking at it on your laptop and phone. Entice your readers to open your emails with well-crafted subject lines. Do you know what the pre-header is? It’s the piece of text you can see directly below the subject line in the list of emails in your inbox. Just like the image below. This is an extra space for you to add a bit more about what your readers will see if they open your email. It can support your subject line, follow on from it and it should definitely add a bit more intrigue to help people decide whether to open or not. Write the subject line and the pre-header text once you’ve finished putting your email together. 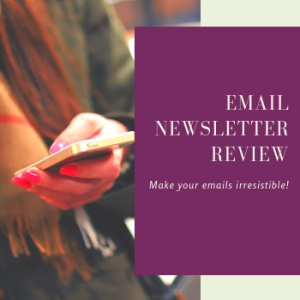 This way, you’ll know exactly what’s in the email and will be able to create a subject line and pre-header text that will encourage your readers to open your email. Do your readers recognise your from name? We like to know whose emails we’re opening, especially in today’s landscape of cybercrime. So, having a recognisable from name is essential. It’s pretty easy for me, as my first name is part of my business name, so my from name is Marketing by Minal. Think about what your from name should be. If it’s just you in your business, then perhaps you can use your first name and your business name, e.g. Jane from The Bookshop. It’s OK to use just your business name too. As long as it’s easily recognisable. Is it what’s on your website? Is it what your business is known as? Making sure it’s consistent will help you get that all-important open. 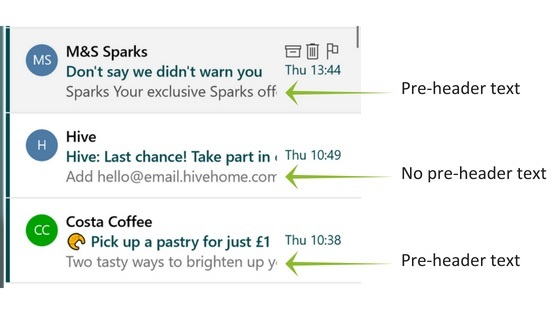 Get your emails opened by being recognisable in people’s inboxes. 6. Are you sending at the right time? When you send your email is an important factor in whether people will open it or not. There’s no hard and fast rule as to when that should be, but below are examples of typically good send days and times for a few types of businesses. If you spot your business time, then this is a good starting point. But the best way to find out a good time to send for you is to test it. Test the day of the week first. When you have a winner, then test different times of the day. Do this by sending your email to a small proportion of your list, which is known as split testing. 7. Do you have the right people on your list? This is pretty vital. If you have people on your list who are not part of your target audience, then, of course, your emails will perform poorly. The answer to this is to clean your email list. Yes, it sounds dull and boring, but imagine how you’ll feel when your open rates soar. Even better, it will impact your click rates, which means your newsletter is having a real impact. A clean list doesn’t just have an effect on your open and click rates. It also has an impact on your pocket. If you’re paying for your email service (if not, why not? ), then by cleaning your list, you’ll be reducing how much you pay for that service. I knew that would get your attention! If you need more reasons for cleaning your list and making it relevant for your business, read this blog post. 8. What does your list expect? Think about when you ask people to join your email list. What do you say to them? Are you setting their expectations? What do I mean by that? Are you telling them how often they will hear from you and what about? Think about it. Would you like to know how often a company will email you and what they’ll tell you? When you set this expectation, you have to stick to it. It’s no use telling people you’ll email them with monthly tips and then bombard them every day with offers. What a way to put your readers off! If this sounds like you, then stop! Go back to what you promised your readers. I know it will make an impact on your email opens. Tell people what they’ll hear about in your emails and how often. Then stick to it. Using email marketing for any small business is important. Using it well will help you to achieve your goals. Why not set aside time now to spruce up your newsletter? Work through the tips above and test to find out what works for you. I know you’ll be pleased with the results! If you like what you read, I send marketing tips to my email list every week. You can get these too, just sign up here.